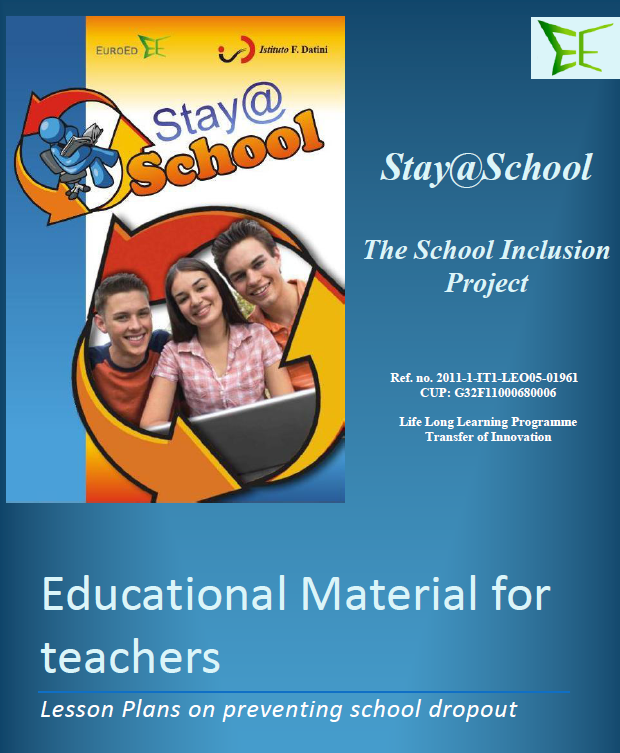 This section of the web site gives the access to the products developed by the teachers involved in the [email protected] project and are addressed to the other teachers in order to help them identify and prevent those behaviours and situations that may lead to early school leaving. The target groups of this activity are students among 16-20 years who are new students at the school and come from different backgrounds, or start a new academic year with new teachers. Some students with problematic academic records. - Analyse previous bad experiences in order to better understand the students situation and identify what should not happen again. Students are divided on small groups. Each group gather the answers if one of the questions on a document, identifying the common ideas. Pooling of resources. Each group comments to the whole class the information found on the answers, highlighting the issues related to relations and communication in the class. Writing of the coexistence plan with the “best” school rules elaborated by all. The Belgian working group proposes an educational tool to be used by teachers and other members of the school staff (educators, headmasters …). Its purpose is to catch students’ attention, ease debate and motivate students to talk and share ideas on a difficult topic, prompt reflection and seek solutions. The tool helps teachers, school staff members and all external people concerned by educational issues to identify and prevent behaviours and situations that can lead to early school leaving. 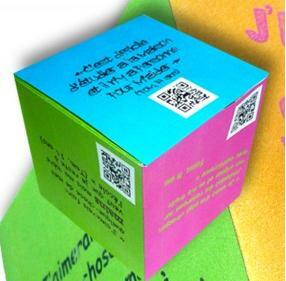 The product is a colourful Cube. Each side is dedicated to a factor of early school leaving and is illustrated by a catchphrase which is the testimony of a student who dropped out and a QR code directing to a video. The video may bring a solution to the situation addressed: a positive example, a message inviting to identify oneself and to seek a solution. The risk factor is not mentioned on the Cube so that students can think about it individually. Students who hesitate to participate in the class debate can leave a note inside the Cube. A page dedicated to the Cube is available on the website of INFOREF: http://inforef.be/pages/outils.php. It contains two patterns for the Cube (one of which can be modified and adapted to teachers’ own context) and guidelines for educational teams. Scanning the school year in its various phases is assumed to be a good practice to start to combat the discomfort and distraction. The method of the 'check list' allows teachers and the school as a whole to reflect on the theme of the dispersion starting from the practical and concrete needs. In developing the tool were kept in mind all the modules of the Training Package on the School Inclusion portal and the results of its workshops. Teacher involved in different phases of school life are the target group of the product which can be used as a general guide, but also as a box in which each teacher can put his experience. This type of self-assessment tools, closed-ended questionnaires, can be easily analyzed and give teachers a realistic insight into the drop out phenomenon in their school. These questionnaires give a sense of the strengths and weaknesses of the current dropout prevention strategies used in schools; they can also provide useful information for more realistic future action plans. They can be applied in any school. The student questionnaires explore the characteristics of students at risk of dropping out and their family background context, academic history, experience with and opinions of schooling, attitude towards school, causes of dropout, and future plans. The teacher questionnaire examines teacher-parent interaction, warning systems for students at risk, and school management and policies. The instruments focus on how schools recognize students at risk, the characteristic of schools with high dropout, reasons that schools believe cause student dropout, and what can be done to prevent dropout. The parent questionnaire examines parents’ experience with the schooling their child has received, parents’ opinion of what should be done to keep children in school, competitive activities that distract their children from school. A lesson plan is vital in teaching, it gives you the guide you need to pull through. Good lesson planning is essential to the process of teaching and learning. A teacher who is prepared is well on his/her way to a successful instructional experience. 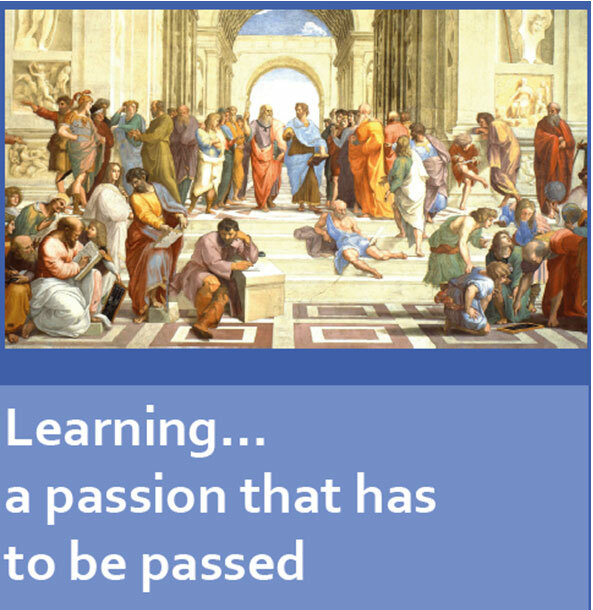 The development of interesting lessons takes a great deal of time and effort. As a new teacher you must be committed to spending the necessary time in this endeavour. The complexity of the factors contributing to pupils’dropping out of school makes planning and preparation absolutely critical. The content has to meet the needs of a wide range of students in the classroom. Thus, samples of lesson plans on this topic are a necessity; they are very useful as long as they rely on solid experience. Successful experience has to be passed on to the others. It gives the chance to the teachers to enhance the quality of education for all the students and provides them with a variety of opportunities to help them integrate into society. These lesson plans have been devised to increase the awareness of the diversity of the issue under discussion. They provide teachers with interesting activities meant to encourage positive and constructive behavior in the classroom. The product aims at promoting afternoon study groups among teachers of the vocational high schools. Teachers who decide to participate in this initiative take care of students one afternoon a week. The product is particularly addressed to first classes teachers. A work-team is instituted in order to support the students and provide them with any useful information to find out appropriate methods and behaviour to study and prevent the scholastic failure and the early school leaving. In particular this type of activity let all teachers know about the level of preparation of each student, identify the students who have scholastic deficiencies in order to consolidate their own learning abilities, improve their meta-cognitive skills and better free-time organisation. This tool is focused on the period of arrival at school, the so-called “Welcome” ”Home” period, starting from September till November. The students, arriving at the new school, need to be welcomed, need to know the new rules and the atmosphere of school, so, for all these reasons, this period has been considered in this tool as strategic for the whole year. At this phase a list of possible activities and modes of operation is reported. 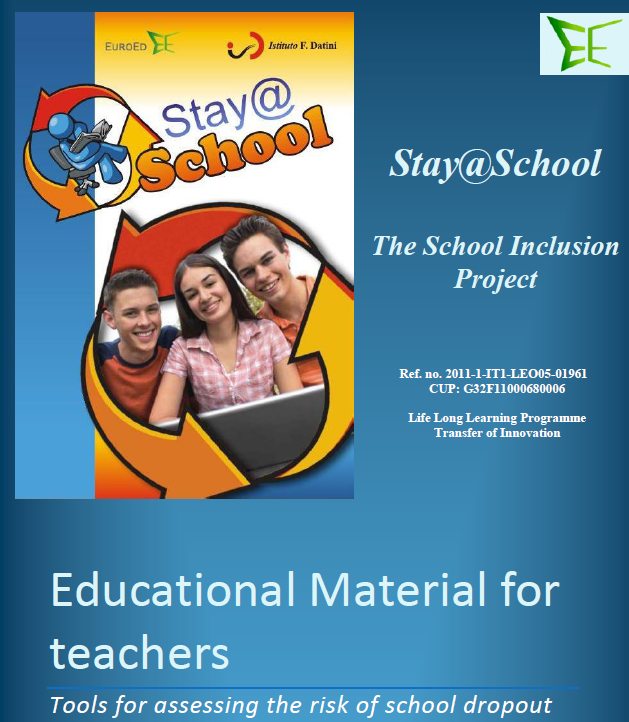 Each school usually has a specific project for this important period of the school year, so the tool, which was conceived during the workshops, tries to offer a practical guide with related materials and documents. Starting from this tool teachers can build a sort of archive and checklist, which serves the school to follow the first activities of the students, especially to recognize the risks of dropping out and identify possible actions, starting from the students’ very first arrival. For each activity we suggest a link to a document to be used or discussed among teachers to make it better. The aims of the product is to help teachers to identify young people at risk of dropping out of education. Since, the earlier students at risk are identified, the more chance there is of resolving the problem and giving the young person the best chance of success. The identification factors to look for which can lead to school ‘drop outs’ are listed. They have been divided into educational, personal and those related to family or community. A list of unacceptable activities, like ridiculing, forcing, compelling, punishing, threatening have been produced. The presentation also includes a series of best practice. Some scenes from the movie have been presented to suggest clear examples of students and teachers behaviours. Teachers watch the movie. Then they meet and share their impressions. They view the powerpoint discussing about their impressions both about the movie and on what is written in the work. Teachers could underline and select what they consider important and achievable, taking note of which parts of the movie had hit them. They meet and share their impressions, discussing their points of view on the movie. Trying to analyze the wrong behavior of teachers and students. At that point they will examine together the powerpoint presentation that deals with the risk factors and how to detect them. 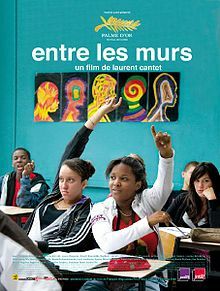 They could make comparisons among teachers of the French school presented in the movie that reflects the reality of that school system with the Italian one and that of their own school. They will decide together if all the tips are shared or not. They will make a own guidelines sheet made to measure for their school approved by the whole school.